Go Speed Racer? Pardon the pun but truthfully, his get up and go got up and went. Bringing the cartoon character Speed Racer to life in live action digital animation sure sounds like a great concept, but the actual reality of the finished product is void of that valid spark necessary to fire the imagination of children. Based upon the 1967 anime cartoon series launched in Japan, the movie version is a futuristic adaptation. The high tech imagery creates a surreal celluloid environment. The racing sequences are spiked with road raging violence and the racing cars defy the laws of gravity and physical velocity. Two heavy weight actors portray Speed's parents: John Goodman and Susan Sarandon are Pops & Mom Racer. Emile Hirsch is Speed Racer and Christina Ricci is Trixie the stunning girlfriend. Roger Allam embodies the evil Royalton. 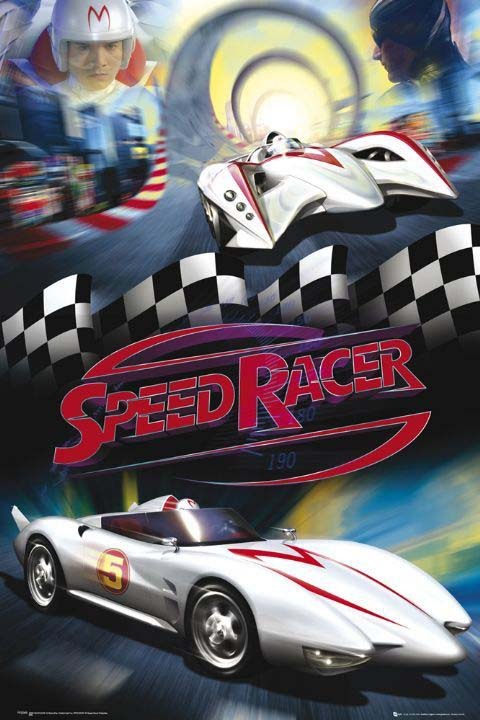 Speed Racer's preoccupation with racing supercharged automobiles was a fascination in his youth that manifests itself as he becomes a young adult. The tragic loss of his older brother Rex fortifies his decision to pursue racing as his passion in life. His internal struggles drive his determination to succeed. Speed Racer is pure fantasy. Targeted as a family film to attract a young clientele, Speed exudes an innocence in his demeanor. His relationship with Trixie is unexplored territory, and their eventual on-screen kiss is staled by a Cootie Warning delivered by mischievous younger brother Sprittle. Curiously, the M symbol on Speed's helmet and the hood of his Mach 5 racing car subliminally resembles the golden arches globally recognized as fastfood. Consequently, product placement and mutual marking promotions associated with motion pictures tarnishes artistic achievement. Speed Racer labored to connect with an audience. Hirsch is convincing in his lead role and humanizes the character of Speed Racer, but it is not enough to overcome the overwhelming digital animation overload that seems to have let the air of the tires of this fast-paced racing adventure.